Become a PADI certified diver in no time by simply participating in all underwater adventures of the Open Water Course or Advanced Open Water Course and without spending time in a classroom during your holiday! Now you can complete your theory online with PADI eLearning! The Open Water diver theory online is available in English, German, French, Italian, Spanish, Dutch and Japanese. The Advanced Open Water Diver is available in English. In fact, more and more languages and courses are being added regularly to the PADI eLearning system. Specialties such as Nitrox as well as PADI Dive Master and Instructor are also available with PADI eLearning. You will find your PADI e-learning link directly here on the left and also at the dive center you will visit on this website!Upon arrival at your Euro-Divers Dive Centre we will schedule your dives for you and after a simple Quick Review and checking your printed eLearning Record your underwater adventure begins.Great benefits! 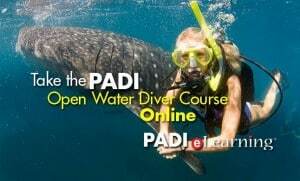 Sign Up For PADI elearning!